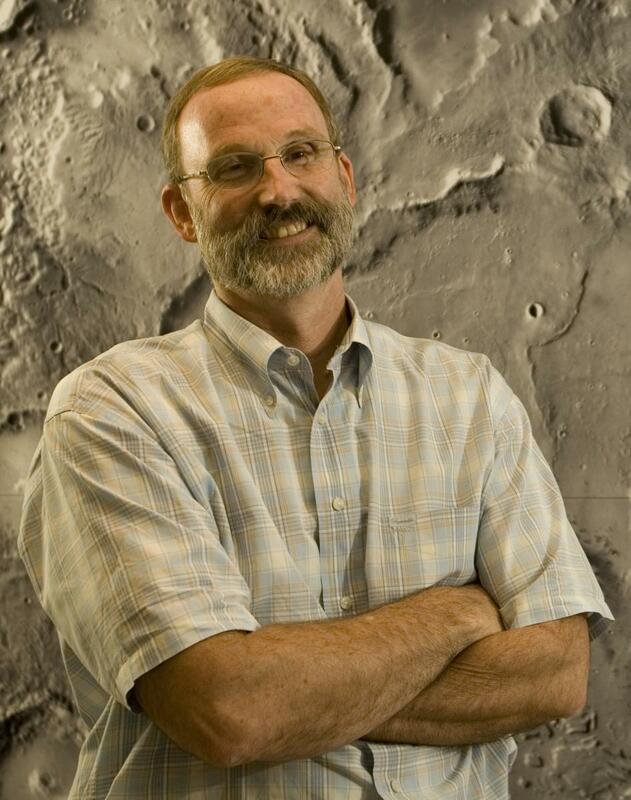 Philip R. Christensen is a Regents Professor of geological sciences and the Ed and Helen Korrick Professor in the School of Earth and Space Exploration at Arizona State University. He completed his Ph.D. in Geophysics and Space Physics at UCLA in 1981. His research interests focus on the composition, physical properties and processes, and morphology of planetary surfaces, with an emphasis on Mars and the Earth. A major element of his research has been the design and development of spacecraft infrared remote sensing instruments. 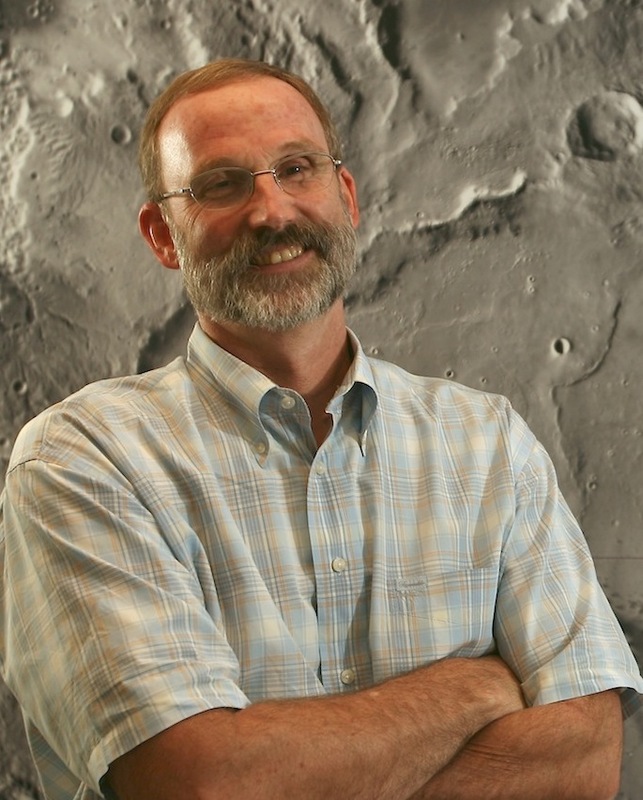 Christensen is the Principal Investigator for the 2001 Mars Odyssey Thermal Emission Imaging System (THEMIS) instrument, and the Thermal Emission System (TES) instrument on Mars Global Surveyor. He is also a Co-Investigator on the Mars Exploration Rover missions, responsible for building and operating the Miniature Thermal Emission Spectrometer (Mini-TES) instruments. He is Principal Investigator for the OSIRIS-REx Thermal Emission Spectrometer (OTES) on NASA's OSIRIS-REx mission to asteroid Bennu (1999 RQ36). His research uses infrared spectroscopy, radiometry, laboratory spectroscopic measurements, field observations, and numerical modeling, and has taken him to field sites in the western U.S., Hawaii, Mexico, and South America. Since the mid-1990's he has pursued the use of spacecraft observations to study environmental and urban development problems on Earth. Christensen was awarded NASA's Exceptional Scientific Achievement Medal in 2003 for his pioneering scientific observations of Mars in the infrared, and was elected as a Fellow of the American Geophysical Union in 2004. He was awarded the NASA Public Service Medal in 2005, the Geological Society of America's G.K. Gilbert Award in 2008, and ASU's Eugene Shoemaker Memorial Award in 2011. Weekly informal discussions of current topics in Mars exploration, including recent science discoveries, NASA exploration policy, and future plans for martian science and engineering missions. Quantitative remote sensing of the Earth and planetary surfaces, with an emphasis on using the interaction of electromagnetic energy with matter to determine the physical properties of surfaces. Emission, absorption, reflection, transmission, and scattering of energy are developed and applied to visible, near-infrared, thermal, and radar observations. Science and engineering of Earth, solar system, and space exploration. Experimental design, engineering design; teaming; the professions of science and engineering. Geological evolution of Mars through analyses of spacecraft data, theoretical modeling, and study of terrestrial analogs; emphasizes current work. Possible field trips to examine Arizona geology. Follow-on to the introductory Remote Sensing course, with an emphasis on advanced techniques and applications. Visble, near-IR, and infrared spectroscopy and radiometry methods are explored in detail. Ashley, J. W., M. P. Golombek, P. R. Christensen, S. W. Squyres, T. J. McCoy, C. Schrˆder, I. Fleischer, J. R. Johnson, K. E. Herkenhoff, and T. J. Parker (2011), Evidence for mechanical and chemical alteration of iron-nickel meteorites on Mars: Process insights for Meridiani Planum, J. Geophys. Res, 116, E00F20. Edwards, C. S., K. J. Nowicki, P. R. Christensen, J. Hill, N. Gorelick, and K. Murray (2011), Mosaicking of global planetary image datasets: 1. Techniques and data processing for Thermal Emission Imaging System (THEMIS) multi-spectral data, Journal of Geophysical Research, 116(E10), E10008. Edwards, C. S., P. R. Christensen, and J. Hill (2011), Mosaicking of global planetary image datasets: 2. Modeling of wind streak thicknesses observed in Thermal Emission Imaging System (THEMIS) daytime and nighttime infrared data, Journal of Geophysical Research, 116(E10), E10005. Piqueux, S., and P. R. Christensen (2011), Temperature-dependent thermal inertia of homogeneous Martian regolith, Journal of Geophysical Research, 116(E7), E07004. Rampe, E. B., M. D. Kraft, T. G. Sharp, D. C. Golden, D. W. Ming, P. R. Christensen, and S. W. Ruff (2011), Detection of allophae on Mars through orbital and in-situ thermal infrared spectroscopy, Lunar and Planet. Sci., 42, Abs. #2145. Ruff, S. W., J. D. Farmer, W. M. Calvin, K. E. Herkenhoff, J. R. Johnson, R. V. Morris, M. S. Rice, R. E. Arvidson, J. F. Bell III, and P. R. Christensen (2011), Characteristics, distribution, origin, and significance of opaline silica observed by the Spirit rover in Gusev crater, Mars, J. Geophys. Res, 116, E00F23. Ruff, S. W., J. D. Farmer, W. M. Calvin, K. E. Herkenhoff, J. R. Johnson, R. V. Morris, M. S. Rice, R. E. Arvidson, J. F. Bell Iii, and P. R. Christensen (2011), Characteristics, distribution, origin, and significance of opaline silica observed by the Spirit rover in Gusev crater, Mars, Journal of Geophysical Research, 116(null), E00F23. Wright, S. P., P. R. Christensen, and T. G. Sharp (2011), Laboratory thermal emission spectroscopy of shocked basalt from Lonar Crater, India, and implications for Mars orbital and sample data, Journal of Geophysical Research, 116(E9), E09006. Zipfel, J., C. Schroder, B. L. Jolliff, R. Gellert, K. E. Herkenhoff, R. Rieder, R. Anderson, J. F. Bell III, J. Brickner, J. A. Crisp, P. R. Christensen, B. C. Clark, J. P.A. de souza, G. Dreibus, C. D'Uston, T. Economou, S. P. Gorevan, B.C.Hahn, G. Klingelhofer, T. J. McCoy, J. H.Y. McSween, D. W. Ming, R. V. Morris, D. S. Rodionov, S. W. Squyres, H. Wanke, S. P. Wright, M. B. Wyatt, and A. S. Yen (2011), Bounce Rock‚A shergottite-Like basalt encountered at Meridiani Planum, Mars, Meteoritics & Planetary Science. Hayward, R. K., L. K. Fenton, K. L. Tanaka, T. N. Titus, and P. R. Christensen (2010), Mars global digital dune database: Dune volume estimates in the north polar region. Lang, N. P., H. Y. M. Jr., L. L. Tornabene, C. J. Hardgrove, and P. R. Christensen (2010), Reexamining the relationship between Apollinaris Patera and the basalts of the Gusev crater plains, Mars, J. Geophys. Res, 115, doi:10.1029/2009JE003397. McConnochie, T. H., J. F. Bell Iii, D. Savransky, M. J. Wolff, A. D. Toigo, H. Wang, M. I. Richardson, and P. R. Christensen (2010), THEMIS-VIS observations of clouds in the martian mesosphere: Altitudes, wind speeds, and decameter-scale morphology, Icarus, 210, 545-565. Milam, K. A., H. Y. McSween Jr, J. Moersch, and P. R. Christensen (2010), Distribution and variation of plagioclase compositions on Mars, Journal of Geophysical Research, 115(E9), E09004. Presley, M. A., and P. R. Christensen (2010), Thermal conductivity measurements of particulate materials: 4. Effect of bulk density for granular particles, J. Geophys. Res, 115(E07003), doi:10.1029/2009JE003482. Presley, M. A., and P. R. Christensen (2010), Thermal conductivity measurements of particulate materials: 5. Effect of bulk density and particle shape, Journal of Geophysical Research, 115(E7), E07004. Baldridge, A. M., and P. R. Christensen (2009), A Laboratory Technique for Thermal Emission Measurement of Hydrated Minerals, Applied Spectroscopy, 63(6), 678-688. Edwards, C. S., J. L. Bandfield, P. R. Christensen, and R. L. Fergason (2009), Global distribution of bedrock exposures on Mars using THEMIS high resolution thermal inertia, J. Geophys. Res, 114, doi:10.1029/2009JE003363. Hayward, R. K., T. N. Titus, T. I. Michaels, L. K. Fenton, A. Colaprete, and P. R. Christensen (2009), Aeolian dunes as ground truth for atmospheric modeling on Mars, J. Geophys. Res, 114, E11012, doi:11010.11029/12009JE003428. Kuzmin, R. O., E. V. Zabalueva, and P. R. Christensen (2009), Estimation and mapping of wintertime increase in water ice content of the Martian surface soil based on seasonal Thermal Emission Spectrometer thermal inertia variations, J. Geophys. Res, 114(E4), doi:10.1029/2008JE003222. Lang, N. P., L. L. Tornabene, H. Y. McSween, and P. R. Christensen (2009), Tharsis-sourced relatively dust-free lavas and their possible relationship to Martian meteorites, Journal of Volcanology and Geothermal Research, 185(1-2), 103-115. Piqueux, S., and P. R. Christensen (2009), A Model of Thermal Conductivity for Planetary Soils 2. Theory for Cemented Soils, J. Geophys. Res, doi:10.1029/2008JE003309. Piqueux, S., and P. R. Christensen (2009), A Model of Thermal Conductivity for Planetary Soils 1. Theory for Unconsolidated Soils, J. Geophys. Res, doi:10.1029/2008JE003308. Squyres, S. W., A. H. Knoll, R. E. Arvidson, J. W. Ashley, J. F. Bell Iii, W. M. Calvin, P. R. Christensen, B. C. Clark, B. A. Cohen, and P. A. de Souza Jr (2009), Exploration of Victoria Crater by the Mars Rover Opportunity, Science, 324(5930), 1058. Bell, J. F., III, T. Glotch, V. Hamilton, T. McConnochie, T. McCord, A. McEwen, P. Christensen, and R. Arvidson (2008), Visible to Near-IR Multispectral Observations of Mars, in The Martian Surface: Composition, Mineralogy, and Physical Properties, edited by J. F. Bell III, Cambridge University Press. Christensen, P. R., J. L. Bandfield, R. L. Fergason, V. E. Hamilton, and A. D. Rogers (2008), The Compositional Diversity and Physical Properties Mapped from the Mars Odyssey Thermal Emission Imaging System (THEMIS), in The Martian Surface: Composition, Mineralogy, and Physical Properties, edited by J. F. Bell, III, Cambridge University Press. Christensen, P. R., J. L. Bandfield, A. D. Rogers, T. D. Glotch, V. E. Hamilton, S. W. Ruff, and M. B. Wyatt (2008), Global Mineralogy Mapped from the Mars Global Surveyor Thermal Emission Spectrometer, in The Martian Surface: Composition, Mineralogy, and PhysicalProperties, edited by J. F. Bell, III, Cambridge University Press. Goldenson, N., S. Desch, and P. Christensen, Non-equilibrium between dust and gas temperatures in the Mars atmosphere, Geophys. Res. Lett., 35, doi:10.1029/2007GL032907, 2008. Osterloo, M. M., V. E. Hamilton, J. L. Bandfield, T. D. Glotch, A. M. Baldridge, P. R. Christensen, L. L. Tornabene, and F. S. Anderson, Chloride-bearing materials in the southern highlands of Mars, Science, 319, DOI: 10.1126/science.1150690, 2008. Piqueux, S., and P. R. Christensen, Deposition of CO2 and erosion of the Martian south perennial cap between 1972 and 2004: Implications for current climate change, J. Geophys. Res., doi:10.1029/2007JE002969, 2008. Tornabene, L., J. Moersch, H. Y. M. Jr., V. Hamilton, J. Piatek, and P. Christensen, Surface and crater-exposed lithologic units of the Isidis Basin as mapped by co-analysis of THEMIS and TES derived data products, J. Geophys. Res, doi:10.1029/2007JE002988, 2008. Christensen, P. R., J. L. Bandfield, R. L. Fergason, V. E. Hamilton, and A. D. Rogers (in press), The Compositional Diversity and Physical Properties Mapped from the Mars Odyssey Thermal Emission Imaging System (THEMIS), in The Martian Surface: Composition, Mineralogy, and Physical Properties, edited by J. F. Bell, III, Cambridge University Press. Christensen, P. R., J. L. Bandfield, A. D. Rogers, T. D. Glotch, V. E. Hamilton, S. W. Ruff, and M. B. Wyatt (in press), Global Mineralogy Mapped from the Mars Global Surveyor Thermal Emission Spectrometer, in The Martian Surface: Composition, Mineralogy, and Physical Properties, edited by J. F. Bell, III, Cambridge University Press. Cushing, G. E., T. N. Titus, J. J. Wynne, and P. R. Christensen, THEMIS observes possible cave skylights on Mars, Geophys. Res. Lett., 34, L17201, doi:17210.11029/12007GL030709,, 2007. Dunn, T. L., H. Y. McSween, Jr., and P. R. Christensen, Thermal emission spectra of terrestrial alkaline volcanic rocks, J. Geophys. Res., 112, doi:10.1029/2006JE002766, 2007. Hayward, R. K., K. F. Mullins, L. K. Fenton, T. M. Hare, T. N. Titus, M. C. Bourke, A. Colaprete, and P. R. Christensen, Mars Global Digital Dune Database and initial science results, J. Geophys. Res., 112, E11007, doi:11010.11029/12007JE002943, 2007. Michalski, J. R., S. J. Reynolds, P. B. Niles, T. G. Sharp, and P. R. Christensen, Alteration mineralogy in detachment zones: Insights from Swansea, Arizona, Geosphere, 3, 184-198; doi: 110.1130/GES00080.00081, 2007. Milam, K. A., J. McSween H. Y., and P.R.Christensen, Plagioclase compositions derived from thermal emission spectra of compositionally complex mixtures: Implications for Martian feldspar mineralogy, J. Geophys. Res., 112, E10005, doi 10010.11029/12006JE002880, 2007. Nowicki, S. A., and P. R. Christensen, Rock abundance on Mars from the Thermal Emission Spectrometer, J. Geophys. Res., 112, doi:10.1029/2006JE002798, 2007. Rampey, M. L., K. A. Milam, H. Y. McSween, Jr., J. E. Moersch, and P. R. Christensen, Identity and emplacement of domical structures in the western Arcadia Planitia, Mars, J. Geophys. Res., 112, E06011, doi:06010.01029/02006JE002750, 2007. Rogers, A. D., J. L. Bandfield, and P. R. Christensen, Global spectral classification of martian low-albedo regions with Mars Global Surveyor Thermal Emission Spectrometer (MGS-TES) data, J. Geophys. Res., 112, E02004, doi:02010.01029/02006JE002726, 2007. Rogers, A. D., and P. R. Christensen, Surface mineralogy of martian low-albedo regions from MGS TES data: Implications for crustal evolution and surface alteration, J. Geophys. Res., 112, E01003, doi:01010.01029/02006JE002727, 2007. Ruff, S. W., and P. R. Christensen, Basaltic andesite, altered basalt, and a TES-based search for smectite clay minerals on Mars, Geophys. Res. Lett., 34, doi:10.1029/2007GL029602, 2007. Stockstill, K. R., J. E. Moersch, H. Y. McSween, Jr., J. Piatek, and P. R. Christensen, TES and THEMIS study of proposed paleolake basins within the Aeolis quadrangle of Mars, J. Geophys. Res., 112, 10.1029/2005JE002517, 2007. Christensen, P. R., Water at the poles and in permafrost regions on Mars, Elements, 2, 151-157, 2006. Christensen, P. R., N. S. Gorelick, G. L. Mehall, and K. C. Murray, THEMIS Public Data Releases, Planetary Data System node, Arizona State University, <http://themis- data.asu.edu>2006. Arvidson, R. E., F. Poulet, R. V. Morris, J.-P. Bibring, J. F. B. III, S. W. Squyres, P. R. Christensen, G. Bellucci, B. L. Ehlmann, W. H. Farrand, R. L. Fergason, M. Golombek, J. L. Griffes, J. Grotzinger, E. A. Guinness, K. E. Herkenhoff, J. R. Johnson, G. Klingelhöfer, Y. Langevin, D. Ming, K. Seelos, R. J. Sullivan, J. G. Ward, S. M. Wiseman, and M. Wolff, Nature and origin of the hematite-bearing plains of Terra Meridiani based on analyses of orbital and Mars Exploration rover data sets, J. Geophys. Res., 111, E12S08, doi:10.1029/2006JE002728, 2006. Arvidson, R. E., et al., Overview of the Spirit Mars Exploration Rover Mission to Gusev Crater: Landing site to Backstay Rock in the Columbia Hills, J. Geophys. Res., 111, E02S01, doi:10.1029/2005JE002499, 2006. Fergason, R. L., P.R.Christensen, J. F. Bell III, M. P. Golombek, K. E. Herkenhoff, and H. H. Kieffer, Physical properties of the Mars Exploration Rover landing sites as inferred from Mini-TES-derived thermal inertia, J. Geophys. Res., 111, E02S21, doi:10.1029/2005JE002583, 2006. Glotch, T. D., J. L. Bandfield, P. R. Christensen, W. M. Calvin, S. M. McLennan, B. C. Clark, A. D. Rogers, and S. W. Squyres, The mineralogy of the light-toned outcrop at Meridiani Planum as seen by the Miniature Thermal Emission Spectrometer and implications for its formation, J. Geophys. Res., 111, doi:10.1029/2005JE002672, 2006. Glotch, T. D., P. R. Christensen, and T. G. Sharp, Fresnel modeling of hematite crystal surfaces and application to martian hematite spherules, Icarus, 181, 408-418, 2006. Golombek, M. P., L. S. Crumpler, J. A. Grant, R. Greeley, N. A. Cabrol, T.J.Parker, J. W. Rice, Jr., J. G. Ward, R. E. Arvidson, J. E. Moersch, R. L. Fergason, P.R.Christensen, A.Castano, R. Castano, A. F. C. Haldeman, R. Li, J. F. Bell, III, and S. W. Squyres, Geology of the Cusev cratered plains from the Spirit rover traverse, J. Geophys. Res., 111, E02S07, doi:10.1029/2005JE002503, 2006. Greeley, R., R. E. Arvidson, P. W. Barlett, D. Blaney, N. A. Cabrol, P. R. Christensen, R. L. Fergason, M. P. Golombek, G. A. Landis, M. T. Lemmon, S. M. McLennan, J. N. Maki, T. Michaels, J. E. Moersch, L. D. V. Neakrase, S. C. R. Rafkin, L. Richter, S. W. Squyres, P. A. de Souza, Jr., R. J. Sullivan, S. D. Thompson, and P. L. Whelley, Gusev crater: Wind-related features and processes observed by the Mars Exploration Rover Spirit, J. Geophys. Res., 111, E02S09, doi:1029/2005JE002491, 2006. Haberle, R. M., M. A. Kahre, J. R. Murphy, P. R. Christensen, and R. Greeley, Role of dust devils and orbital precession in closing the Martian dust cycle, Geophys. Res. Lett., 33, 10.1029/2006GL026188, 2006. Jakosky, B. M., B. M. Hynek, S. M. Pelkey, M. T. Mellon, S. Martínez-Alonso, N. E. Putzig, N. Murphy, and P. R. Christensen, Thermophysical properties of the MER and Beagle II landing site regions on Mars, J. Geophys. Res., 111, doi:10.1029/2004JE002320, 2006. Johnson, J. R., J. Sohl-Dickstein, W. M. Grundy, R. E. Arvidson, J. Bell, III, P. Christensen, T. Graff, E. A. Guinness, K. Kinch, R. Morris, and M. K. Shepard, Radiative transfer modeling of dust-coated Pancam calibration target materials: Laboratory visible/near-infrared spectrogoniometry, J. Geophys. Res., 111, E12S07, 10.1029/2005JE002658, 2006. Kieffer, H. H., P. R. Christensen, and T. N. Titus, CO2 jets fromed by sublimation beneath translucent slab ice in Mars' seasonal south polar ice cap, Nature, 442, 793-796, doi:710.1038/nature04945, 2006. Li, R., B. A. Archinal, R. E. Arvidson, J. Bell, P. Christensen, L. Crumpler, D. J. D. Marais, K. Di, T. Duxbury, M. Golombek, J. Grant, R. Greeley, J. Guinn, A. Johnson, R. L. Kirk, M. Maimone, L. H. Matthies, M. Malin, T. Parker, M. Sims, S. Thompson, S. W. Squyres, and L. A. Soderblom, Spirit rover localization and topographic mapping at the landing site of Gusev crater, Mars, J. Geophys. Res., 111, E02S06, doi:10.1029/2005JE002483, 2006. McConnochie, T. H., J. F. Bell, D. Savransky, G. Mehall, M. Caplinger, P. R. Christensen, L. Cherednik, K. Bender, and A. Dombovari, Calibration and in-flight performance of the Mars Odyssey Thermal Emission Imaging System visible imaging subsystem (THEMIS VIS), J. Geophys. Res., 111, 10.1029/2005JE002568, 2006. McSween, H. Y., S. W. Ruff, R. V. Morris, J. F. Bell, K. Herkenhoff, R. Gellert, K. R. Stockstill, L.L. Tornabene, S. W. Squyres, J. A. Crisp, P. R. Christensen, T. J. McCoy, D. W. Mittlefehldt, and M. Schmidt, Alkaline volcanic rocks from the Columbia Hills, Gusev crater, Mars, J. Geophys. Res., 111, E09S91, doi:10.1029/2006JE002698, 2006. McSween, H. Y., et al., Characterization and petrologic interpretation of olivine-rich basalts at Gusev Crater, Mars, J. Geophys. Res., 111, E02S10, doi:1029/2005JE002477, 2006. Michalski, J. R., M. D. Kraft, T. G. Sharp, L. B. Williams, and P. R. Christensen, Emission spectroscopy of clay minerals and evidence for poorly crystalline aluminosilicates on Mars from Thermal Emission Spectrometer data, J. Geophys. Res., 111, E03004, doi:03010.01029/02005JE002438, 2006. Ruff, S. W., P. R. Christensen, D. L. Blaney, W. H. Farrand, J. R. Johnson, J. R. Michalski, J. E. Moersch, S. P. Wright, and S. W. Squyres, The rocks of Gusev Crater as viewed by the Mini- TES instrument, J. Geophys. Res., 111, doi:10.1029/2006JE002747, 2006. Spanovich, N., M. D. Smith, P. H. Smith, M.J. Wolff, P. R. Christensen, and S. W. Squyres, Surface and near-surface atmospheric temperatures for the Mars Exploration Rover landing sites, Icarus, 180, 314-320, doi:310.1016/j.icarus.2005.1009.1014, 2006. Squyres, S. W., O. Aharonson, R. E. Arvidson, I. J. F. Bell, P. R. Christensen, B. C. Clark, J. A. Crisp, W. Farrand, T. Glotch, M. P. Golombek, J. Grant, J. Grotzinger, K. E. Herkenhoff, J. R. Johnson, B. L. Jolliff, A. H. Knoll, S. M. McLennan, H. Y. McSween, J. M. Moore, J. J. W.Rice,andN. Tosca,BedrockformationatMeridianiPlanum,Nature,443, doi:10.1038/nature05212, 2006. Tornabene, L. L., J. E. Moersch, J. McSween H. Y., A. S. McEwen, J. L. Piatek, K. A. Milam, and P. R. Christensen, Identification of large (2-10 km) rayed craters on Mars in THEMIS thermal infrared images: Implications for possible Martian meteorite source regions., J. Geophys. Res., 111, doi:10.1029/2005JE002600, 2006. Christensen, P. R., The Many Faces of Mars, Scientific American, July, 293, 32-39, 2005. Christensen, P. R., H. H. Kieffer, and T. Titus, Infrared and visible observations of south polar spots and fans, Eos Trans, AGU, 86(52), Fall Meet. Suppl., Abstract P23C-04, 2005. Christensen, P. R., H. Y. McSween, Jr., J. L. Bandfield, S. W. Ruff, A. D. Rogers, V. E. Hamilton, N. Gorelick, M. B. Wyatt, B. M. Jakosky, H. H. Kieffer, M. C. Malin, and J. E. Moersch, Evidence for igneous diversity and magmatic evolution on Mars from infrared spectral observations, Nature, 436, doi:10.1038/nature03639, 2005. Christensen, P. R., S. W. Ruff, R. L. Fergason, T. D. Glotch, N. Gorelick, B. M. Jakosky, M. D. Lane, A. S. McEwen, H. Y. McSween, Jr., G. L. Mehall, K. Milam, J. E. Moersch, S. M. Pelkey, A. D. Rogers, and W. B. Wyatt, Mars Exploration Rover candidate landing sites as viewed by THEMIS, Icarus, 187, 12-43, 2005. Clark, B. C., R. V. Morris, S. M. McLennan, R. Gellert, B. Jolliff, A. H. Knoll, S. W. Squyres, T.
K. Lowenstein, D. W. Ming, N. J. Tosca, A. Yen, P. R. Christensen, S. Gorevan, J. Bruckner, W. Calvin, G. Dreibus, W. Farrand, G. Klingelhoefer, H. Waenke, J. Zipfel, J. F. Bell III, J. Grotzinger, H. Y. McSween, and R. Rieder, Chemistry and mineralogy of outcrops at Meridiani Planum, Earth Planet. Sci. Lett., 240, 73-94, 2005. Crumpler, L. S., et al., Mars Exploration Rover Geologic traverse by the Spirit rover in the Plains of Gusev Crater, Mars, Geology, 33, 809-812, 2005. Cushing, G. E., T. N. Titus, and P. R. Christensen, THEMIS VIS and IR observations of a high- altitudeMartiandustdevil,Geophys.Res.Lett.,32,L23202, doi:23210.21029/22005GL024478, 2005. Edwards, C. S., J. L. Bandfield, P. R. Christensen, and R. L. Fergason, Global distribution of bedrock on Mars using THEMIS high resolution thermal inertia, Eos Trans. AGU, 86(52), Fall Meet. Suppl., Abstract P21C-0158, 2005. Glotch, T. D., and P. R. Christensen, Geologic and mineralogic mapping of Aram Chaos: Evidenceforawater-richhistor y ,J.Geophys.Res.,110,E09006, doi:09010.01029/02004JE02389, 2005. Golombek, M. P., R. E. Arvidson, I. J.F. Bell, P. R. Christensen, J. A. Crisp, L. S. Crumpler, B. L. Ehlmann, R. L. Fergason, J. A. Grant, R. Greeley, A. F. C. Haldemann, D. M. Kass, T. J. Parker, J. T. Schofield, S. W. Squyres, and R. W. Zurek, Assessment of Mars Exploration Rover landing site predictions, Nature, 436, 44-48, doi:10.1038/nature03600, 2005. Greeley, R., R. Arvidson, J. F. Bell, III, P. R. Christensen, D. Foley, A. F. C. Haldemann, R. O. Kuzmin, G. Landis, L. D. V. Neakrase, G. Neukum, S. W. Squyres, R. Sullivan, S. D. Thompson, P. L. Whelley, and D. Williams, Martian variable features: New insight from the Mars Express Orbiter and the Mars Exploration Rover Spirit, J. Geophys. Res., 110, DOI: 10.1029/2005JE002403, 2005. Hamilton, V. E., and P. R. Christensen, Evidence for extensive olivine-rich bedrock in Nili Fossae, Mars, Geology, 33, 433-436, 2005. Haskin, L. A., et al., Water alteration of rocks and soils on Mars at the Spirit rover site in Gusev crater, Nature, 436, 66-69, doi:10.1038/nature03640, 2005. McEwen, A. S., B. S. Preblich, E. P. Turtle, N. A. Artemieva, M. P. Golombek, M. Hurst, R. L. Kirk, D. M. Burr, and P. R. Christensen, The rayed crater Zunil and interpretations of small impact craters on Mars Icarus, 176, 351-381, 2005. McLennan, S. M., et al., Provenance and diagenesis of the evaporite-bearing Burns formation, Meridiani Planum, Mars, Earth Planet. Sci. Lett., 240, 95-121, 2005. Michalski, J. R., M. D. Kraft, T. G. Sharp, L. B. Williams, and P. R. Christensen, Mineralogical constraints on the high-silica Martian surface component observed by TES, Icarus, 174, 161-177, 2005. Mouginis-Mark, P. J., and P. R. Christensen, New observations of volcanic features on Mars from the THEMIS instrument, J. Geophys. Res., 110, doi:10.1029/2005JE002421, 2005. Rogers, A. D., P. R. Christensen, and J. L. Bandfield, Compositional heterogeneity of the ancient martian crust: Analysis of Ares Vallis bedrock the THEMIS and TES data, J. Geophys. Res., 110, DOI:10.1029/2005JE002399, 2005. Yen, A. S., et al., An integrated view of the chemistry and mineralogy of martian soils, Nature, 436, 49-54, doi:10.1038/nature3637, 2005. Christensen, P.R., S.W. Ruff, R.L. Fergason, A.T. Knudson, R.E. Arvidson, J.L. Bandfield, D.L. Blaney, C. Budney, W.M. Calvin, T.D. Glotch, M.P. Golombek, T.G. Graff, V.E. Hamilton, A. Hayes, J.R. Johnson, H.Y. McSween, Jr., G.L. Mehall, L.K. Mehall, J.E. Moersch, R.V. Morris, A.D. Rogers, M.D. Smith, S.W. Squyres, M.J. Wolff, and M.B. Wyatt, Initial results from the Miniature Thermal Emission Spectrometer experiment at the Spirit landing site at Gusev Crater, Science, 305, 837- 842, 2004. Christensen, P.R., M.B. Wyatt, T.D. Glotch, A.D. Rogers, S. Anwar, R.E. Arvidson, J.L. Bandfield, D.L. Blaney, C. Budney, W.M. Calvin, A. Fallacaro, R.L. Fergason, N. Gorelick, T.G. Graff, V.E. Hamilton, A.G. Hayes, J.R. Johnson, A.T. Knudson, H.Y. McSween, Jr., G.L. Mehall, L.K. Mehall, J.E. Moersch, R.V. Morris, M.D. Smith, S.W. Squyres, S.W. Ruff, and M.J. Wolff, Mineralogy at Meridiani Planum from the Mini-TES Experiment on the Opportunity Rover, Science, 306, 1733-1739, 2004. Arvidson, R.E., R.C. Anderson, P. Bartlett, I. J. F. Bell, P.R. Christensen, P. Chu, K. Davis, B.L. Ehlmann, M.P. Golombek, S. Gorevan, E.A. Guinness, A.F.C. Haldemann, K. Herkenhoff, G. Landis, R. Li, R. Lindemann, D.W. Ming, T. Myrick, T. Parker, L. Richter, I. F.P. Seelos, S.W. Squyres, R.J. Sullivan, and J. Wilson, Localization and physical properties experiments conducted by Opportunity at Meridiani Planum, Science, 306, 1730-1733, 2004. Glotch, T.D., R.V. Morris, P.R. Christensen, and T.G. Sharp, Effect of precursor mineralogy on the thermal infrared emission spectra of hematite: Application to martian hematite mineralization, J. Geophys. Res., 109, E07003, doi:10.1029/2003JE002224, 2004. Grant, J.A., J.A. Grant, R. Arvidson, J.F.B. III, N.A. Cabrol, M.H. Carr, P. Christensen, L. Crumpler, D.J.D. Marais, B.L. Ehlmann, J. Farmer, M. Golombek, F.D. Grant, R.
Greeley, K. Herkenhoff, R. Li, H.Y. McSween, Jr., D.W. Ming, J. Moersch, J.W.R. Jr., S. Ruff, L. Richter, S. Squyres, R. Sullivan, and C. Weitz, Surficial deposits at Gusev Crater along Spirit rover traverses, Science, 305, 807-810, 2004. McSween, H.Y., Jr., et al., Basaltic rocks analyzed by the Spirit rover in Gusev Crater, Science, 305, 842-845, 2004. Smith, M.D., M.J. Wolff, M.T. Lemmon, N. Spanovich, D. Banfield, C.J. Budney, R.T. Clancy, A. Ghosh, G.A. Landis, P.Smith, B. Whitney, P.R. Christensen, and S.W. Squyres, First atmospheric results from the Mars Exploration rovers Mini-TES, Science, 306, 1750-1753, 2004. Soderblom, L.A., et al., Soils of Eagle crater and Meridiani Planum at the Opportunity rover landing site, Science, 306, 1723-1726, 2004. Squyres, S.W., et al., The Opportunity Rover’s Athena Science Investigation at Meridiani Planum, Mars, Science, 306, 1698-1703, 2004. Squyres, S.W., et al., The Spirit Rover's Athena science investigation at Gusev Crater, Mars, Science, 305, 794-799, 2004. Squyres, S.W., J.P. Grotzinger, I. J.F. Bell, P.R. Christensen, B.C. Clark, J.A. Crisp, W.H. Farrand, K.E. Herkenhoff, G. Klingelhöfer, A.H. Knoll, S.M. McLennan, H.Y. McSween, R.V. Morris, R. Rieder, and L.A. Soderblom, In-situ evidence for an ancient aqueous environment on Mars, Science, 306, 1709-1714, 2004.